Learn how to live in harmony with your baby. Get lots of FREE stuff worth 100s of dollars! There are a number of reasons babies cry. Many of them can be identified using a process of elimination: dirty diapers, hunger, or discomfort at being put into a car seat, for example. Although many of these reasons are physical, sometimes the way to stop baby crying is to address an underlying psychological or emotional issue. Separation anxiety is one of those possible causes. The phrase simply refers to the stress that babies and young children feel when they are away from a parent or trusted guardian. If your baby cries all day at daycare, this could be the cause—but separation anxiety could also be the culprit if your child cries when you just go into the next room! The good news is that separation anxiety is totally normal and not a cause for concern. Almost every child goes through it at some point or points in his or her life. According to child development experts, children can start experiencing separation anxiety at about six months of age, and for many, it starts to ease off around the age of 18-24 months. It’s especially noticeable when a parent or guardian leaves the house, and it can also happen at night when you put the child in his crib or he wakes up and sees that you are not there. There are a number of strategies to help separation anxiety and soothe a crying baby who is experiencing it. If your baby’s separation anxiety takes place at night, then start by making sure that you have a good bedtime routine, with plenty of time for your baby to wind down and feel secure: holding or snuggling with your baby, as well as reading or lullabies, is a good way to go. If your baby wakes up in the middle of the night and cries, going to him is perfectly acceptable. However, try to keep these visits brief, and don’t interact with your baby too much—just let him know that you are there, and let him fall back asleep on his own without a lot of help. For daytime separation anxiety, if you are a stay-at-home parent then you can choose to simply let your baby outgrow it: take him with you if he seems anxious about you leaving. For working parents who must leave their baby with a caregiver, you can set up a “getting to know you” date with your baby and their new caregiver: set up a time when your baby and the caregiver can play while you are in the same room or the next room. If you are leaving your baby at daycare or with a babysitter, then always tell him where you are going and when you’ll be back—this helps to establish confidence that you will come back, always! And, although separation might be difficult for you as well, try to convey confidence and calm to your child. And remember that children do outgrow separation anxiety! 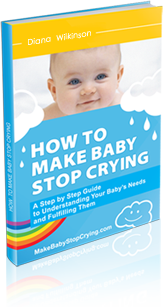 How to Stop a Baby from Crying?